These two are rain jackets. They are mostly preferred during rains, hikes but most importantly, they are all-rounded jackets. They come in handy at any given time. These two jackets are competitive in quality, design, the level of comfort offered any other factors somebody may want to have a look at when purchasing. We are going to have a look at both jackets and hopefully by the end of this you n will be at a position of choosing which jacket is favorable for you. We will begin with the marmot precip jacket. First and foremost, this jacket is of an affordable price. This jacket has been recently updated with NanoPro 2.5 layer coated cloth texture. It has a notch hood with it, cuff closures and unique solid ventilation features. It also has good breathability space and a zip too. 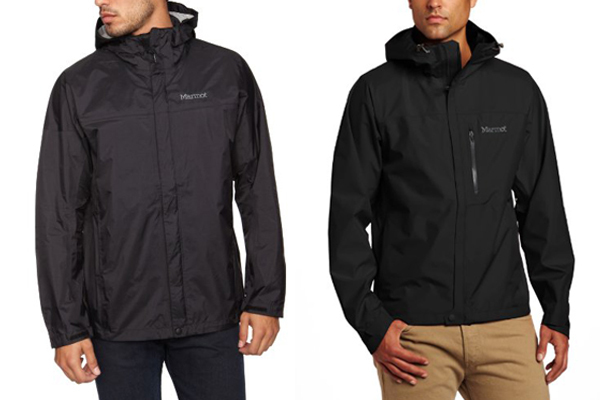 This jacket, marmot precip, is an excellent choice for outdoor activities. It keeps one protected from all elements. However, this jacket has its cons. It has no chest pocket and sorry to say but it is not quite as breathable since the breathablity is just quite above average. The minimalist jacket is heavy and hence less packable. It has a super burly and cool pit zipper, thick diameter cinch cords and has an easy to use toggle at the hem and hood. The lining of its shell is less “plasticky”. Its breathability however is still just above average like the marmot precip jacket. Its hood is taped and brings with it a substantial bill that is able to withstand heavy rain and strong wind. This jacket performs well in everyday activities or hiking and it is extremely comfortable with a beautiful design. This jacket does not have a stuffed pocket. It less desirable to bring to a place where rainstorm is not a guarantee. Its price is affordable. Since both jackets have poor breathability, one can always open up the zipper to let in cool fresh air around the body. Marmot precip vs minimalist. Both jackets are quite a catch. The major difference come to the fabric of the jackets. minimalist is heavy while marmot precip is light. The sole decision on the best jacket lies with the customer depending on where one wants to use the jacket.